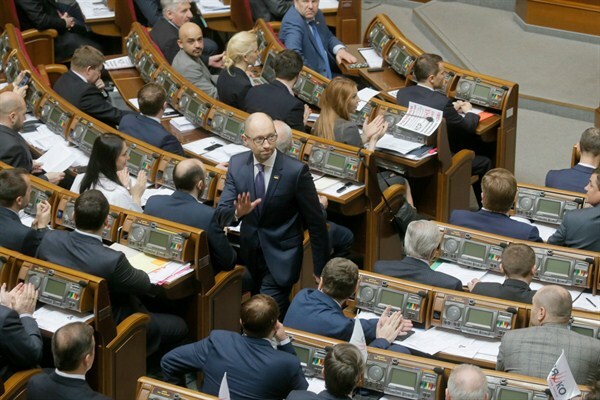 Former Ukrainian Prime Minister Arseniy Yatsenyuk leaves parliament after his resignation, Kiev, April 14, 2016 (AP photo by Efrem Lukatsky). Earlier this month, in a nonbinding referendum, Dutch voters firmly rejected a treaty that would establish closer ties between the European Union and Ukraine. The Netherlands currently holds the EU’s rotating presidency, and for Prime Minister Mark Rutte, a supporter of the treaty, the vote was a clear rebuke. The Netherlands, like many other countries across Europe, is in the midst of a populist backlash against European integration in general. Referendum voters also expressed discontent with migration and economic regulation, echoing sentiments held everywhere from France to Hungary.